Property Details: Four Bedroom, Four+ Bathroom Beachfront Residence with more than 2700 square feet. This beachfront residence at Sea Watch in Perdido Key Florida is beautifully decorated with Italian tile, a new HVAC system, and a custom wall unit with fireplace in the living area....perfect for cozy evenings. You will enjoy the gulf-front Master Suite and private, individual hallways leading to each guest bedroom so every guest enjoys privacy and water views. The open floor-plan offers incredible views of the Gulf of Mexico through floor-to-ceiling glass and is ideal for entertaining and large family gatherings. The spacious kitchen offers abundant cabinet space, granite counter-tops and stainless steel appliances. Each bedroom has walk-in closets and there are additional hallway storage closets. 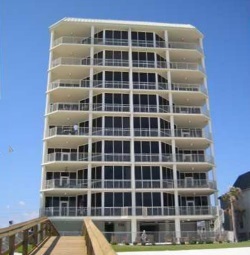 Sea Watch owners enjoy wonderful amenities including heated indoor pool, exercise facility, billiards room, and Gulf-front pool....come see the Sea Watch condo in Perdido Key FL.